A revised version of this article will be published in Jane's Intelligence Review during the summer of 2013. 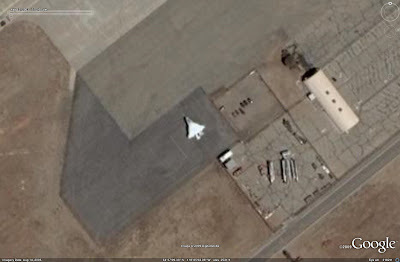 Many facilities and locations around the world appear pixellated in Google Earth for various reasons, usually because of security concerns due to the sensitive or military nature of the majority of these sites. Using the historical imagery feature in Google Earth, it is possible in some cases to defeat this censorship and view imagery of these areas. The imagery will not necessarily be the most current available, but it is still useful nonetheless. Censored imagery can be viewed in numerous locations inside of Google Earth. Google has often claimed that it will listen to the security concerns of national agencies and governments, but in the case of the "revealing" of the Australian nuclear reactor a few years ago claimed that it did not see a reason to censor imagery in that specific case as the same area could be viewed in other imagery sources. This begs the question as to who is actually censoring the images, and it is likely that, at least in the case of Europe, the local providers (many of whom use aerial collection platforms for national geospatial functions) are doing the censoring to comply with local restrictions. Google then acquires and uploads this imagery, which is often censored. 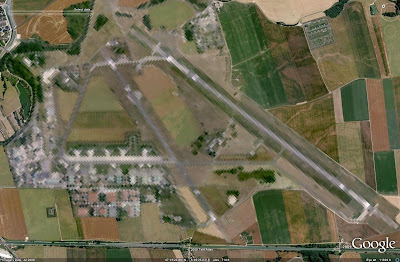 Military facilities in France and the Netherlands are two key examples of censorship making its way into Google Earth. This is not a fault of Google in any way; Google is merely acquiring as much imagery as possible and making it available at no cost using their program. Google has not shown any major inclination to censor imagery of its own volition, even with the objections of Australia and later India being on record. Now, with the incorporation of Google Earth 5's historical imagery feature, it is possible to view imagery from potentially different providers and circumvent the censorship that exists in many areas. Employing the historical imagery feature allows imagery to be accessed which has not been censored, due perhaps to its inclusion into the database prior to the censorship being effected, or perhaps because it was sourced from a provider which does not believe it is responsible for censoring its products. 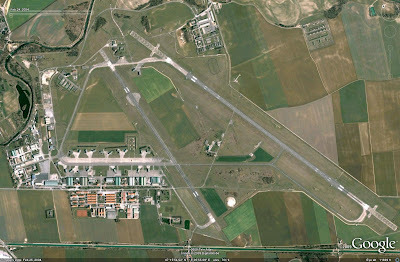 The image below depicts Dijon AB as it appeared in 2004. There have likely not been any major alterations to the basic infrastructure in the two years that elapsed between the two images, so the historical imagery should be effective for use in analyzing the facility. Whatever the reasoning behind the decision, Google has allowed censored imagery to be incorporated into Google Earth. Thanks to the inclusion of the historical imagery feature in Google Earth 5, many of these locations can now be viewed, albeit from earlier and less current dates. Whether or not this continues to be the case will depend on Google's realization of this potential error, or their decision to no longer allow altered imagery to be included into the data set. A few quick notes about the site. First off, I've added a few new labels for my articles. The most prominent are Historic Imagery and Book Reviews. The first will be attached to any post incorporating Google Earth's historical imagery, and the second will be attached to...well, ok, that one should be self explanatory! Secondly, I'm considering either incorporating the comment moderation feature, whereby I will have to manually approve comments to my articles, or disabling comments altogether, relying on the forum and e-mail correspondance for feedback and inquiries. This is due to the increasing number of idiot spammers who are starting to creep into the comments, advertising all manner of things which have absolutely nothing to do with the content of the articles published here. The problem with the first method is that only users with Google accounts of some sort (blogger, gmail, etc) will be able to comment. The problem with the second method is that people will have to join the forum or send an e-mail should they wish to comment on something. What do the readers think? I haven't decided to respond in either fashion just yet, but I thought I should let you all know what I'm thinking and why. Google Earth 5 was recently released, and incorporates a wealth of new features for the user to exploit. From an analytical standpoint, the most interesting new feature is the ability to view historical imagery of many areas. Google Earth's new historical imagery feature allows users to examine past imagery that has been overwritten in the main viewer by either more recent or higher resolution imagery. Take Belgrade, for example. When viewed from an Eye Altitude of 50 miles, it can clearly be seen that the city and the surrounding area has been imaged over time, and that a composite mosaic of these images are currently visible to create a more complete image. For those unfamiliar with the term, the Eye Altitude is the height from which the visual vantage point on screen is being viewed. It is located at the bottom right of the image window in the Status Bar. Returning to the example of Belgrade, the historical imagery feature allows users to view the images used to provide the default view of Belgrade as a series of images, with each series building upon the last and adding the next most recent set of imagery to the screen. An excellent overview of how to fully exploit this new feature can be found here. It should be noted that not every piece of imagery visible in Google Earth's default view is available in the historical imagery feature, nor does using this feature limit the on-screen view to only the imagery captured on the date selected. An interesting and useful application of the historical imagery feature is that it will actually bring images into better focus at certain altitudes. To better illustrate this point, a simple exercise has been derived. 1. Open Google Earth, and click the icon to add a placemark. 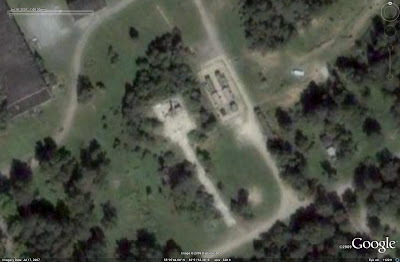 Copy the following coordinates into the Latitude and Longitude boxes: 56°55'57.57"N 40°32'34.96"E This will create a placemark on a mobile ICBM base near Teykovo in Russia. 2. Travel to the new placemark and zoom in so that the Eye Altitude is approximately 2500 feet. 3. Note that the date that the image was captured is August 12, 2007. 4. Under the View menu at the top left of the screen, select Historical Imagery. The Historical Imagery slider will appear along the upper left portion of the image window. The slider is currently set to coincide with the current date, which at the time of writing is 2009. Three blue lines appear in the slider, indicating images which may be selected for viewing of that particular area. 5. Set the slider to coincide with the date at which the image was captured. In this case, this will be the far right blue line. Simply drag the slider to the left until it locks into position at that date. 6. Once the slider is moved to the left from its default position, note that the image appears to have become clearer to a slight degree, helping to further accentuate many of the details. 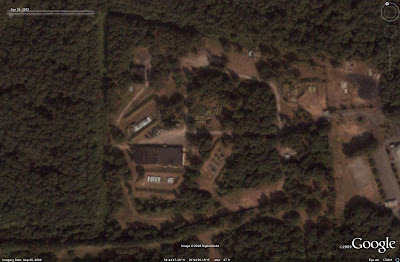 In this example, pay close attention to the three grey rectangular buildings in the center of the compound. Moving the slider to the left results in the detail on the roof of each building to become far more distinct. As can clearly be seen, employing the historical imagery feature can be seen to provide clearer imagery. The imagery is likely loaded by Google Earth in a slightly less refined format at higher Eye Altitudes in order to facilitate quicker loading times. It should be noted that zooming in closer will result in the fully detailed image being visible, but exploiting this aspect of the historical imagery function does permit clearer images of a broader scale to be examined and saved for further use or analysis. This is exceptionally valuable when examining images containing many small objects such as vehicles or aircraft, or large facilities. The following images are examples of historical images captured in Google Earth, dealing with subjects which will be of interest to readers of this site. Examine these images, and then compare them to the default locations in Google Earth to fully comprehend the value of the historical imagery feature. The first image depicts Bangalore, India, in February of 2007. Note that three LCA prototypes are visible on the tarmac. The next image illustrates a useful application of the historical imagery feature. 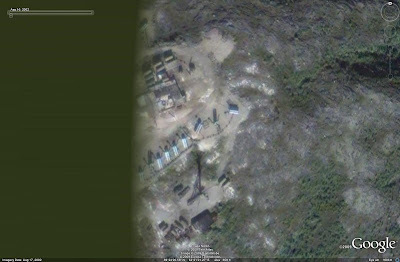 An S-300PS battery in Kaliningrad is shown, sited at a location which is mostly obscured by cloud cover in the current default imagery set. As can be seen, the historical imagery feature can be used to depict locations which may not be visible in Google Earth's default data set. The following image depicts the parking apron at the Kazan aircraft manufacturing plant. Three Tu-160 strategic bombers can be seen. 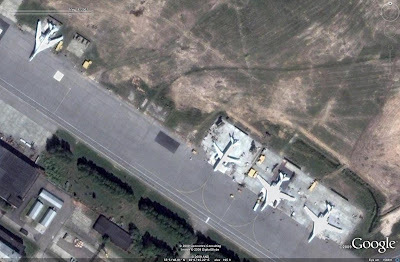 Scanning through the past imagery of this location indicates that various Tu-160s were in and out of Kazan for maintenance. Next up is another SAM battery, this time an S-300PT battery on the Kola Peninsula. This highlights yet another advantage of having access to historical imagery in Google Earth: the default image of this location is newer, but is of a lesser resolution. The following image depicts the Russian Navy's Admiral Kuznetsov aircraft carrier moored at sea near Murmansk. 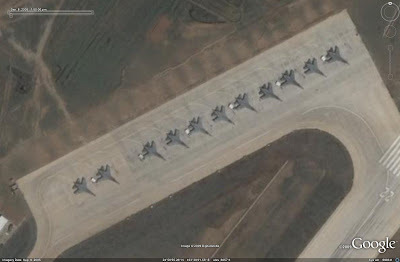 A series of FLANKER fighter jets can be seen on the tarmac of Luliang AB in China in the next image. 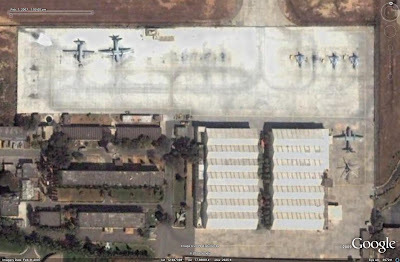 Currently available imagery shows this location to have been refurbished as a new J-10 operating base; the addition of the historical imagery allows an analyst to track the history of the aircraft types operated here. The next image depicts a deployed 64N6 battle management radar near Novosibirsk. 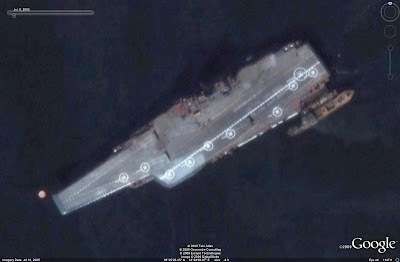 This image allows analysts to identify the empty position currently visible in the default data set as an unoccupied 64N6 radar position. The following image depicts the World's Ugliest Aircraft (who else was suprised that the satellite didn't break capturing the image), Boeing's X-32 demonstrator, on the ramp at Palmdale in August of 2003. This highlights one of the past disadvantages of Google Earth: sometimes new imagery removes interesting and unique sights from view. The addition of the historical imagery feature rectifies this problem to a large degree. A third S-300P series SAM battery is seen in the image below. This is an S-300PMU battery deployed near Beijing. 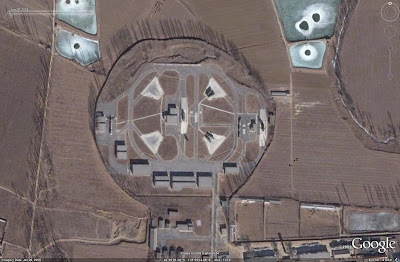 Current imagery shows this site to have been abandoned in the past, but its past operational status allows analysts to investigate Chinese SAM deployment patterns. 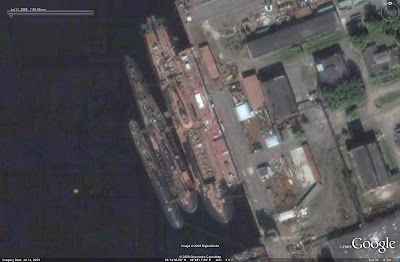 The next image is truly fascinating, showing three submarines undergoing various stages of dismantlement at Severodvinsk in Russia. The missile tubes can clearly be seen to have been removed from both the Typhoon SSBN and the Oscar SSGN. The final example is a truly historical image, from July of 2005. It depicts the Yankee Notch SSGN conversion pierside at Nerpa. 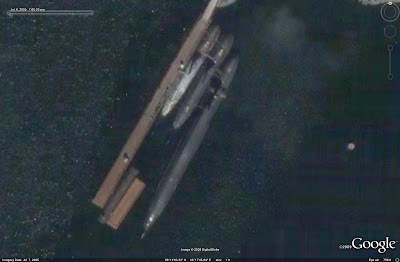 This submarine has since been scrapped, and Google Earth's historical imagery feature allows users to view it when it was still in existance, illustrating the characteristic layout of the converted SSBN. The historical imagery feature in Google Earth 5 provides the analyst with a wealth or new data to exploit. It is now possible to conduct a degree of analysis previously available to only those users with access to other sources of imagery. Both trend and temporal analysis can be conducted, allowing the analyst to note changes occuring over time in certain areas. This new feature will certainly bring about a new appreciation for open source imagery and the analytical products which can be derived from its exploitation.